Alfie · All the Things You Are · Always · And So It Goes · Autumn in New York · Beauty and the Beast · Brazil · Blue Skies · Body and Soul · Call Me Irresponsible · Can't Help Falling in Love · Candy · Caravan · Cry Me a River · Easter Parade · Edelweiss · Endless Love · A Foggy Day · Friends in Low Places · Georgia on My Mind · Heart and Soul · Here's That Rainy Day · How Deep Is the Ocean · I Love Paris · I Shot the Sheriff · I've Got the World on a String · The Impossible Dream · Isn't It Romantic? · It's Only a Paper Moon · The Lady Is a Tramp · Lazy River · Let's Fall in Love · Love Is Here to Stay · Makin' Whoopee! · Mona Lisa · Moon River · Moonlight in Vermont · My Funny Valentine · Oh, Pretty Woman · Piano Man · Precious and Few · Release Me · Satin Doll · Small World · Somewhere Out There · Sophisticated Lady · Strawberry Fields Forever · Summer in the City · Tears in Heaven · Ticket to Ride · Unforgettable · What'll I Do · When I Fall in Love · When You Wish Upon a Star · You Are the Sunshine of My Life · and hundreds more! Amazed · At the Hop · Autumn Leaves · Bohemian Rhapsody · Cabaret · California Girls · Centerfold · Chariots of Fire · Crazy · Dust in the Wind · Earth Angel · Eleanor Rigby · Fever · Fire and Rain · From a Distance · Hello, Dolly! · Hey Jude · I Am Woman · Imagine · Joy to the World · Kansas City · La Bamba · Lady · Linus and Lucy · Longer · Me and Bobby McGee · Meditation · Misty · More · More Than Words · My Way · Oye Como Va · Peggy Sue · The Rainbow Connection · Respect · Route 66 · Shout · Spanish Eyes · Stormy Weather · Take Five · Thriller · Time in a Bottle · Unchained Melody · Wave · The Way We Were · Wonderful Tonight · Y.M.C.A. · You've Got a Friend · and hundreds more! Ain't Misbehavin' · All of Me · Autumn in New York · Basin Street Blues · Blue Skies · Body and Soul · Can't Help Lovin' Dat Man · Cocktails for Two · Everybody Loves My Baby · Falling in Love with Love · Gee Baby, Ain't I Good to You · Have You Met Miss Jones? · How Deep Is the Ocean · It Don't Mean a Thing (If It Ain't Got That Swing) · Just a Gigolo · Mood Indigo · Moonglow · My Blue Heaven · My Romance · Ol' Man River · Puttin' On the Ritz · Remember · Solitude · St. Louis Blues · When I Take My Sugar to Tea · When My Baby Smiles at Me · Why Was I Born? · You Made Me Love You · You Took Advantage of Me · You're My Everything · more! April in Paris · Between the Devil and the Deep Blue Sea · Bewitched · Candy · Caravan · Cherokee · Darn That Dream · A Fine Romance · Heart and Soul · I'll Be Seeing You · I'll Walk Alone · I've Got My Love to Keep Me Warm · It's Only a Paper Moon · Marie · Moonlight in Vermont · My Funny Valentine · The Nearness of You · Pennies from Heaven · Prelude to a Kiss · Sentimental Journey · Stompin' at the Savoy · Stormy Weather · A String of Pearls · Take the "A" Train · Tuxedo Junction · You'd Be So Nice to Come Home To · more! Alice in Wonderland · Autumn Leaves · Beyond the Sea · Born to Be Blue · Cry Me a River · I Wanna Be Loved · I'm Late · If I Should Lose You · In Walked Bud · Lady Bird · Lazy Afternoon · Lost in the Stars · My One and Only Love · Picnic · Stella by Starlight · Stolen Moments · Tenderly · Unchained Melody · When Sunny Gets Blue · Young at Heart · many more! Alfie · All Blues · As Long As He Needs Me · Bernie's Tune · Black Coffee · Blue Champagne · Blue in Green · Blue Train (Blue Trane) · Bonita · Call Me Irresponsible · Cast Your Fate to the Wind · A Child Is Born · Come Back to Me · DonÕt Rain on My Parade · Eleven · Follow Your Heart · Four on Six · Georgia on My Mind · Giant Steps · Goodnight, My Someone · Green Haze · I Left My Heart in San Francisco · I Loved You Once in Silence · If I Ruled the World · Iris · Judy · Lady Day · Lester Left Town · Moon River · More · Peel Me a Grape · Slightly Out of Tune (Desafinado) · This Masquerade · Triste · Waltz for Debby · What Am I Here For? · and more. 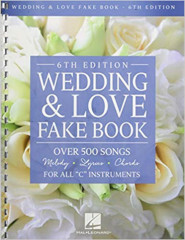 The best wedding fake book just got better! The 4th edition of this classic resource features over 450 songs, updated to include some of today's most popular love songs, as well as classical and sacred titles. For piano, vocal, guitar, electronic keyboard and all "C" instruments. 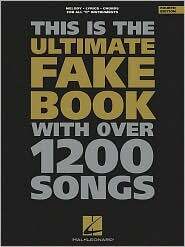 Essential for every professional musician! ! All of Me * Ave Maria * Bless the Broken Road * Clair De Lune * Dream a Little Dream of Me * (Everything I Do) I Do It for You * The First Time Ever I Saw Your Face * Glory of Love * Have I Told You Lately That I Love You * Hornpipe * I Only Have Eyes for You * Jesu, Joy of Man's Desiring * Love Me Tender * My Heart Will Go On (Love Theme from 'Titanic') * Only You (And You Alone) * Precious and Few * Romeo and Juliet (Love Theme) * She's Always a Woman * A Thousand Years * Trumpet Voluntary * Unchained Melody * Unforgettable * Wedding March (Bridal Chorus) * Wonderful Tonight * You Raise Me Up * Your Song * and more. 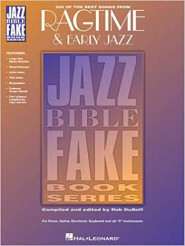 The Just Standards Real Book contains 250 classic songs, from show tunes to jazz standards, that are the core required repertoire for musicians all over the world. Production teams in both the U.S. and the U.K. took great care to ensure the accuracy and usability of each arrangement and original composer sources were consulted to ensure that the arrangements remained true to the composers' intentions. Plus, useful and important chord substitutions are indicated for each arrangement, allowing the user to pick from the original chords or the more popular jazz versions.